Germinal centers (GCs) are inducible lymphoid microenvironments that support the generation of memory B cells, affinity maturation, and isotype switching. Previously, phenotypic transitions following in vivo B cell activation have been exploited to discriminate GC from non-GC B cells in the mouse and to delineate as many as seven distinct human peripheral B cell subsets. To better understand the differentiative processes occurring within murine GCs, we sought to identify subpopulations of GC B cells corresponding to discrete stages of GC B cell ontogeny. We performed multiparameter flow-cytometric analyses of GC B cells at consecutive time points following immunization of BALB/c mice with SRBC. We resolved the murine GC compartment into subsets based on the differential expression of activation markers, surface Ig isotypes, and differentiation Ags. Class-switched and nonswitched GC B cells emerged contemporaneously, and their relative frequencies remained nearly constant throughout the GC reaction, perhaps reflecting the establishment of a steady state. A significant percentage of the nonswitched B cells with a GC phenotype exhibited surface markers associated with naive B cells, including CD23, surface IgD, and high levels of CD38 consistent with either prolonged recruitment into the GC reaction or protracted expression of these markers during differentiation within the GC. Expression of the activation marker BLA-1 was dynamic over time, with all GC B cells being positive early after immunization, followed by progressive loss as the GC reaction matured into the second and third week. Implications of these results concerning GC evolution are discussed. Three to 4 days following immunization with a thymus-dependent Ag, an oligoclonal cohort of B cells activated within or along the borders of the T cell areas of secondary lymphoid tissue colonizes adjacent B cell follicles, forming structures termed germinal centers (GCs).3 GCs are inducible lymphoid microenvironments comprised primarily of Ag-specific B cells, Ag-specific CD4+ Th cells, follicular dendritic cells, and macrophages, and are the principal anatomic sites associated with: 1) expansion of Ag-specific B cell clones; 2) affinity maturation via somatic hypermutation and subsequent Ag-driven selection; 3) apoptosis of B cells failing this stringent selection process; 4) generation of memory B cells (1, 2, 3, 4, 5, 6, 7, 8). The GC reaction is critically dependent upon cognate interactions between Ag-specific B and T cells, and represents one of two developmental pathways to which activated B cells commit during T-dependent responses, the other being the differentiation to Ab-secreting plasma cells. Despite the accumulating data regarding molecular requirements for GC formation, such as the critical role for CD40-CD40L interactions (9) and the developmental requirements for TNF-α, TNFR1, LT-α, LT-β, and LT-βR (10, 11, 12, 13, 14), much remains unclear regarding the processes associated with GCs. Little is known regarding the mechanisms that regulate commitment of B cells to the GC, somatic hypermutation, and differentiation to the memory cell or plasma cell stage. Although current investigation is beginning to reveal candidate molecules that participate in murine GC regulation and terminal differentiation, such as OX40-OX40L and the transcription factor Blimp-1 (15, 16, 17, 18), a more detailed understanding of the various stages of GC maturation is needed. An initial step toward this goal is the phenotypic and functional characterization of GC B cell subsets. During primary B lymphopoiesis, committed precursors progress through successive stages of maturation and selection, a process accompanied by the acquisition of unique cell surface phenotypes determinable by multiparameter flow cytometry (19, 20, 21, 22). Indeed, the phenotypic characterization of distinct B cell precursor populations has greatly facilitated subsequent investigations of genes required for or regulating B lineage commitment and differentiation. Exploiting changes in cell surface phenotype following peripheral B cell activation, Pascual et al. (23) similarly utilized flow cytometry to identify phenotypes potentially corresponding to sequential stages of peripheral B cell differentiation in the human. Subsequent isolation and molecular and functional analysis have suggested developmental relationships between these subsets and permitted the construction of a linear model of Ag-driven B cell differentiation (4). In addition, recent in vitro studies have partially recapitulated Ag-induced developmental stages associated with the GC (24). In the mouse, several groups have employed flow cytometry and/or immunohistology to describe phenotypic characteristics distinguishing GC B cells from other B cell subsets (25, 26, 27, 28). Initial studies examining GC B cell phenotypes elicited during primary or secondary humoral response utilized heterologous erythrocytes (SRBC) as Ag (25). More recently, the phenotype of GC B cells evoked during the genetically restricted response of C57BL/6 mice to the hapten (4-hydroxy-3-nitrophenyl)acetyl (NP) has been partially characterized (27, 28). However, no report explicitly investigating the ontogeny and distribution of selected activation Ags and surface Ig (sIg) isotypes within the GC B cell compartment has been published. Such a study would have the potential to identify discrete GC B cell subsets that possibly correspond to distinct stages of GC B cell ontogeny. The SRBC system, previously exploited by Nieuwenhuis and colleagues (8) to determine the oligoclonality of the GC reaction in rats and Kraal et al. (25) to partially examine murine GC B cell phenotypes, was selected for study due to its potential to induce robust polyclonal GC responses in an adjuvant-independent manner. This work presents multiparameter flow-cytometric data resolving GC B cells (defined as B220+PNAhigh splenic mononuclear cells from immunized mice) into discrete subsets based on the differential expression of several cell surface markers, including BLA-1, sIgM, sIgD, sIgG1, CD23, and CD38. Examination of sIg heavy and light expression by GC B cells revealed that isotype switching preceded or was concomitant with GC formation, established IgM as the predominant isotype expressed by GC B cells, and revealed an apparent steady state between switched and nonswitched GC B cells. B220+PNAhigh B cells defined by sIgD, CD38, and CD23 expression provided evidence for protracted recruitment into GCs throughout the first 2–3 wk of the primary response, revealing populations potentially corresponding to early stages following commitment to, or differentiation within, the GC reaction. Expression of the activation Ag BLA-1 was dynamic during the GC response, and GC B cell subsets defined by BLA-1 expression or absence correlated with the inductive, established, and dissociative phases of the GC response. Further phenotypic heterogeneity within the GC B cell compartment was revealed by four-color flow cytometry, wherein B220+PNAhigh cells were simultaneously examined for the expression of combinations of the aforementioned surface determinants. Implications of these results on the further study and characterization of GC B cells are discussed. Eight- to 16-wk-old female BALB/c mice were obtained from Charles River Laboratories (Wilmington, MA) and housed in a specific pathogen-free facility. CD40L−/− mice were bred in our colony from breeding pairs kindly supplied by Dr. Jacques Peschon (Immunex, Seattle, WA). TNFR1−/− mice were provided by Dr. Charles Lutz (University of Iowa, Iowa City, IA). Following immunization, animals were housed in a clean housing facility until sacrificed on specific days postimmunization. The following reagents were used during the flow-cytometric studies: RA3-6B2, a rat IgG anti-mouse B220; 1D3, a rat IgG anti-mouse CD19; clone 90, a rat IgG anti-mouse CD38; Jo2, a hamster IgG anti-mouse CD95 (PharMingen, San Diego, CA); 53-10.1, a rat IgG anti-mouse BLA-1; M1/69, a rat IgG anti-mouse CD24 (heat-stable Ag (HSA)); 1C10, rat IgG anti-mouse CD40; CY34.1.2, mouse IgG anti-mouse CD22; 7E9, rat IgG anti-mouse CD21/CD35; PS/2, rat IgG anti-mouse VLA-4; F441, rat IgG anti-mouse LFA-1; YN1, rat IgG anti-mouse ICAM-1; b-7-6, rat IgG anti-mouse IgM; 11-26, rat IgG anti-mouse IgD; B3B4, a rat IgG anti-mouse CD23; GL-1, rat IgG anti-mouse CD86; GL-7, a rat IgM directed against an undefined Ag; S7, a rat IgG anti-mouse CD43; M5114, a rat IgG anti-mouse MHC II; 281-2, a rat anti-mouse Syndecan 1 (PharMingen); polyclonal goat anti-mouse κ light chain; polyclonal goat anti-mouse IgG1; PNA, specific for terminal galactosyl (β-1,3) N-acetylgalactoseamine residues. Biotin-conjugated polyclonal goat anti-mouse IgG1, PE-conjugated polyclonal goat anti-mouse κ light chain, and PE-streptavidin were purchased from Southern Biotechnology Associates (Birmingham, AL). Chromatographically purified rat and goat IgG (Jackson ImmunoResearch, West Grove, PA) were used as isotype controls. FITC-PNA and FITC-streptavidin were purchased from Vector Laboratories (Burlingame, CA). Texas Red-streptavidin was purchased from Leinco Technologies (Ballwin, MO) and The Jackson Laboratory (Bar Harbor, ME). mAbs were semipurified from HB101 serum-free supernatants by 50% ammonium sulfate precipitation and conjugated to biotin, PE, Texas Red, or Cyanine 5.18 using standard procedures. Cyanine 5.18-streptavidin was prepared in our laboratory using standard procedures. Mice were injected once i.p. with 0.2 ml of 10% v/v SRBC (Colorado Serum Company, Denver, CO) in balanced salt solution (BSS; equivalent to 1–5 × 108 SRBC) or 25 μg of TNP-Ficoll (Solid Phase Sciences, San Rafael, CA). Splenocytes were examined at 4, 6, 8, 10, 12, 14, 16, 18, 20, 22, 24, and 26 days postimmunization. On the selected days postimmunization, animals were anesthetized with Metofane (methoxyfluorane) and animals sacrificed by cervical dislocation. Spleens were removed and cell suspensions prepared by pressing the excised spleens between the frosted ends of two glass slides, followed by suspension in BSS. Cells were washed by centrifugation at 1500 rpm for 7 min at 4°C and resuspended in staining buffer (SB; BSS supplemented with 5% bovine calf serum and 0.1% sodium azide). Mononuclear cells were isolated by density centrifugation over FicoLite-LM (Atlanta Biologicals, Norcross, GA) for 20 min at 2500 rpm at room temperature. Cells at the interface were collected and resuspended in BSS and again washed by centrifugation at 1500 rpm for 7 min at 4°C. Viable cells were enumerated by hemocytometer and resuspended at a final concentration of 50 × 106 cells/ml in SB. A total of 5 × 105 splenocytes in SB was added to the appropriate mixture of biotinylated, FITC-, PE-, cyanine 5.18-, or Texas Red-conjugated Abs, and fluorochrome-conjugated PNA in the presence of 25 μg 2.4G2 (anti-FcγR) and 10 μl normal rat serum to minimize Fc receptor-dependent background staining. Cells were incubated on ice for 20 min, then washed twice with SB. Biotinylated reagents were visualized by the addition of appropriately conjugated streptavidin. After 20 min on ice, cells were again washed twice with SB, suspended in fixative (1% formaldehyde in 1.25× PBS), and run on a FACSVantage flow cytometer (Becton Dickinson, Mountain View, CA) featuring a primary argon ion laser and a rhodamine 6G CR559 dye head laser (Coherent, Palo Alto, CA) pumped by a second argon ion laser. A minimum of 30,000 events was collected per sample. Low angle and orthogonal light scatter were used to exclude dead cells and debris, and electronic compensation was utilized to correct for spectral overlap between FITC/PE and Texas Red/cyanine 5.18. Data were stored on a VAX station 3200 computer equipped with DESK FACS analysis software (kindly provided by Wayne Moore, Stanford University, Stanford, CA). Two-color contours are represented as 2% probability plots. Two-color contours from four-color flow-cytometric studies are represented as 5% probability plots. In those experiments in which goat anti-κ light chain or goat anti-IgG1 Abs were utilized, it was necessary to first incubate cells with these reagents in the absence of rat or mouse Abs and blocking agents. Cells were washed after treatment with the goat Abs, followed by addition of blocking agents, and stained as described above. To facilitate analysis and comparison of populations defined by the expression or absence of particular surface determinants, data for each time point presented in Figs. 3⇓A, 4A, and 5A were derived from the same mouse. Confocal microscopic analysis was performed as described previously (29). Briefly, spleens from unimmunized or SRBC-immunized animals were harvested and embedded in 4% agarose in HBSS and sectioned in a vibrating microtome (Microcut H12; Energy Beam Sciences, Agawam, MA), and 500-μm sections were incubated overnight at 4°C with FITC-conjugated anti-IgD (11, 12, 13, 14, 15, 16, 17, 18, 19, 20, 21, 22, 23, 24, 25, 26) and cyanine 5.18-conjugated PNA (both used at a concentration of 10–20 μg/ml in PBS/1% BSA/0.02% sodium azide). Mouse IgG was included to minimize Fc-dependent background staining. After washing, the samples were mounted in slides with PBS/azide/10% glycerol and analyzed on the confocal microscope (Bio-Rad 1024; Bio-Rad, Hercules, CA). Using multiparameter flow cytometry, we identified and enumerated GC B cells 4–26 days following primary immunization of BALB/c mice with SRBC. B220+PNAhigh cells, previously defined by flow cytometry and immunofluorescence as GC B cells (25, 26), were apparent by day 4 postimmunization, reached a peak frequency by days 6–8, and then decreased to one-half this maximum frequency between days 12 and 14 postimmunization (Fig. 1⇓). B220+PNAhigh cells could still be identified into the third and fourth week postimmunization, but by day 42, only a residual B220+PNAhigh population was detected (Fig. 1⇓, and data not shown). This kinetic profile is consistent with previous immunohistologic, stathmokinetic, and flow-cytometric analyses of GC evolution (28, 30, 31, 32). These results also demonstrate the robust nature of the SRBC response and the potential to analyze GC B cells in detail. Kinetics of the B220+PNAhigh population elicited by SRBC immunization. On the indicated days postimmunization, splenocytes from animals challenged with SRBC were spun through FicoLite-LM, and mononuclear cells stained with cyanine 5.18-anti-B220 and FITC-PNA. Numbers within the contour plots are the percentages of viable mononuclear cells with a B220+PNAhigh phenotype observed at that given time point and are representative of three to four independent experiments. The range of frequencies of B220+PNAhigh for each time point is as follows: day 4 (4.2–5.8%), day 6 (5.8–9.5%), day 8 (6.3–9.6%), day 10 (3.5–6.7%), day 12 (3.5–5.9%), day 14 (2.9–4.6%), day 16 (1.9–2.9%), day 18 (2.1–4.0%), day 20 (1.8–3.7%), day 22 (1.7–3.6%), day 24 (1–2%). To confirm the B220+PNAhigh cells as an exclusive GC B cell population, we further defined the conditions under which cells of this phenotype could be elicited. GCs are Ag inducible, T cell dependent, and are absent in mice rendered deficient in CD40L (33) or TNFR1 (34). 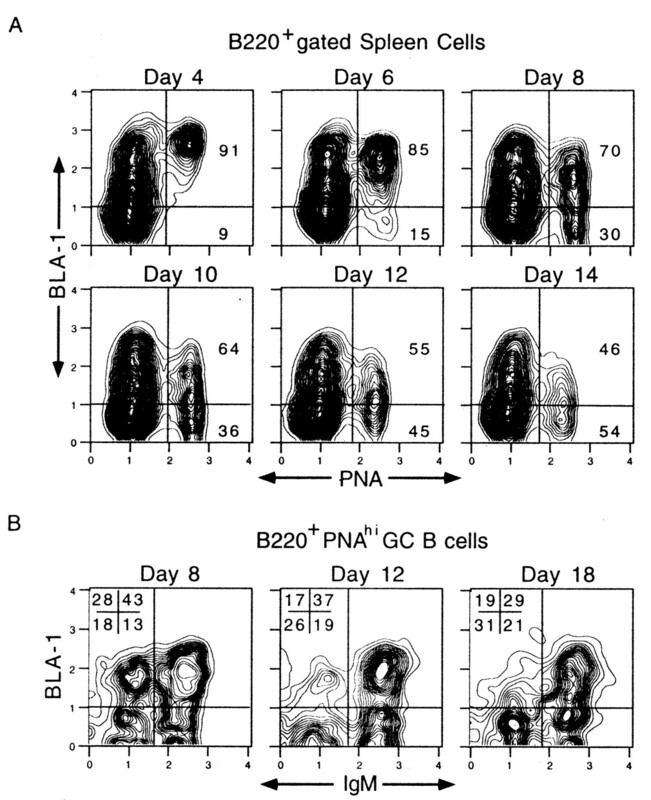 Correspondingly, the B220+PNAhigh cells were observed in mice immunized 6 days previously with SRBC in BSS, but not with BSS alone nor with TNP-Ficoll, a TI-2 Ag inducing few or no GCs (35), confirming both the Ag and T cell dependence of the B220+PNAhigh population (Fig. 1⇑, and data not shown). Likewise, B220+PNAhigh cells were undetectable following SRBC immunization of mice lacking CD40L or TNFR1 (data not shown). To further substantiate the identity of the B220+PNAhigh cells, we more thoroughly characterized the phenotype of this population. 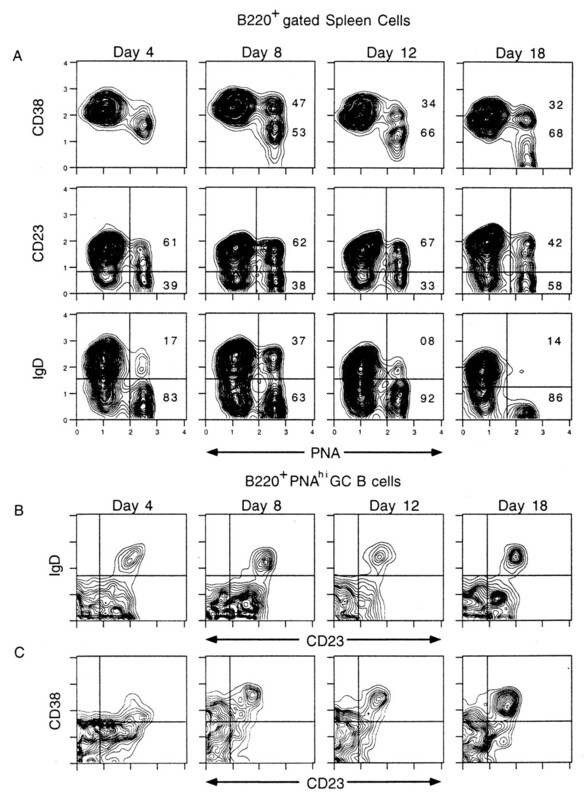 The B220+PNAhigh cells were determined to consist of mature B cells because they uniformly expressed the B cell lineage markers CD19, CD21/35, CD22, and CD40, excluding contamination by either non-B cells or immature B cells (Fig. 2⇓ and Table I⇓). In addition, and consistent with earlier findings (25, 28), the B220+PNAhigh population was not enriched for Ab-forming cells (AFCs), as demonstrated by the virtual absence of AFC-associated markers such as CD43 and Syndecan-1 (CD138) (Table I⇓). Furthermore, as shown in Fig. 2⇓, the majority of B220+PNAhigh cells expressed heightened levels of CD95 (Fas) and the Ag recognized by the mAb GL-7, as has been previously reported for GC B cells (5, 36). Although GL-7 expression roughly overlapped with high avidity for PNA, GL-7 expression was heterogeneous within the B220+PNAhigh population, and a population of B220+PNAlow cells expressing GL-7 was detected (Fig. 2⇓). The significance of GL-7 heterogeneity within the GC compartment, also apparent in immunohistochemical analyses of GCs (37), is unclear at this time. Collectively, these data demonstrate that B220+PNAhigh cells are mature B cells present only when GC formation occurs and which possess the phenotypic attributes of GC B cells, but not AFCs. 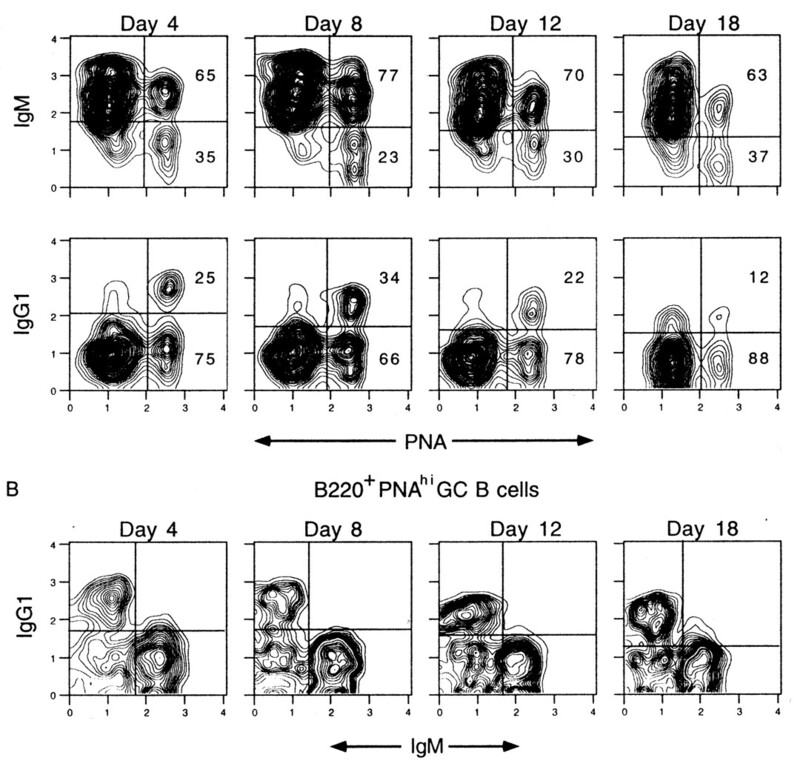 B220+PNAhigh cells are B cells that exhibit the phenotypic attributes of GC B cells. At day 8 postimmunization, splenic mononuclear cells were stained with cyanine 5.18 anti-B220, FITC-PNA, and biotin-conjugated Abs specific for the indicated surface determinants, followed by PE-streptavidin. The contour plots are derived from B220+-gated splenocytes and depict the correlated expression of CD19, CD95, and GL-7 with PNA. Identical results were obtained on days 4–14 (data not shown). The numbers within the GL-7 contour plot are the percentages of GL-7+ and GL-7− cells within the B220+PNAhigh population, and are representative of three independent experiments. The range of percentage of B220+PNAhigh cells that were GL-7+ at that time point was 64–71%. Having established a reproducible system for induction of GC responses, we further analyzed the phenotype of murine GC B cells by investigating the expression and distribution of selected cell surface markers within the GC B cell compartment at consecutive time points following primary immunization. Cohorts of mice were challenged with SRBC, and 4–18 days following immunization, splenic mononuclear cells were subjected to multiparameter flow-cytometric analysis in which mAbs specific for one or two of the surface markers listed in Table I⇑ were used in conjunction with anti-B220 mAb and fluorochrome-conjugated PNA to delineate GC B cells. As shown in Fig. 2⇑ and summarized in Table I⇑, GC B cells prominently expressed CD19, CD21/35, CD22, CD40, and CD95. In addition, GC B cells also were found to express high levels of HSA (CD24) and class II MHC molecules, intermediate levels of CD11a and CD54, and low levels of VLA-4 (Table I⇑). However, these proteins were uniformly expressed by GC B cells on all days examined (data not shown), and discrete GC B cell subpopulations defined by the presence or absence of these surface markers were therefore not evident. In contrast, GC B cell subsets defined by the expression of sIg isotypes and activation markers were readily detected. Because GCs are associated with isotype switching (reviewed in Ref. 38 ; see also Refs. 30, 32, 39), we evaluated the distribution and kinetics of sIgM, sIgG1, and sIgG2a expression following primary antigenic challenge. In Fig. 3⇓A, sIgM+ GC B cells were detected at day 4 and represented approximately two-thirds of the GC B cell compartment, with one-third being sIgM−. Correspondingly, approximately one-fourth to one-third of the GC B cell population was sIgG1+. The relative frequencies of sIgM+ and sIgG1+ GC B cells remain constant throughout the primary GC response. A, Splenic mononuclear cells were isolated 4–18 days postimmunization and stained with cyanine 5.18 anti-B220, FITC-PNA, and biotin-conjugated anti-IgM or goat anti-mouse IgG1, followed by PE-streptavidin. The contour plots show the correlated expression of sIgM or sIgG1 and PNA by B220+-gated cells. B, Cells were stained with Texas Red anti-B220, FITC-PNA, PE-conjugated anti-IgM, and biotin anti-mouse IgG1, followed by cyanine 5.18-streptavidin. The contour plots show the correlated expression of sIgM and sIgG1 by B220+PNAhigh-gated cells. The numbers within the contour plots in A represent the percentages of total B220+PNAhigh cells determined to be positive or negative for sIgM or sIgG1, and are representative of three to four independent experiments. Inflections between populations revealed by anti-IgM or anti-mouse IgG1 staining served as the cutoff for designation of cells as either positive or negative for the respective marker. Ranges of percent positives for sIgM were as follows: day 4 (55–82%), day 8 (55–82%), day 12 (56–72%), day 18 (58–74%). Range of percent positives for sIgG1 were as follows: day 4 (20–29%), day 8 (25–34%), day 12 (22–26%), day 18 (12–22%). Surprisingly, despite the expansion and subsequent diminution of the GC B cell compartment over time, the percentage of total GC B cells expressing or lacking either sIgM or sIgG1 remained nearly constant throughout the primary GC reaction, even 3–4 wk postimmunization (Fig. 3⇑A). In contrast, and characteristic of the BALB/c response, sIgG2a+ GC B cells were infrequent upon SRBC immunization, and not always detected (data not shown). Using four-color flow cytometry to simultaneously examine expression of sIgM and sIgG1, a mutually exclusive pattern of sIgM and sIgG staining was observed on days 4, 8, 12, and 18 (Fig. 3⇑B). This demonstrates the sIgG1+ cells to be bona fide class-switched GC B cells, and not cells with Fc receptor-bound immune complexes. In addition, the relative frequencies of sIgM+ and sIgG1+ cells did not change by treating cells with a low pH buffer before staining (data not shown). Although IgG1 is the major target of isotype switching upon SRBC challenge in BALB/c mice, the results in Fig. 3⇑B indicate switching to other isotypes. Because virtually all of the GC B cells at all time points were κ light chain positive (data not shown) (26, 40), the sIgM, sIgG1 negative cells are likely to represent infrequent sIgG2+, sIgA+, and sIgE+ cells. The contemporaneous emergence of sIgM+ and sIgG1+ GC B cells, as evidenced by our flow-cytometric analyses, suggests that the initiation of isotype switching occurs very early after, concomitant with, or even before the induction of the GC reaction following SRBC immunization. Intriguingly, there was no progressive conversion, as measured by frequency, from sIgM+ to class-switched GC B cells during the primary response. Furthermore, the data presented in this work corroborate earlier immunohistochemical and flow-cytometric studies indicating that class switching precedes somatic hypermutation within the murine GC, a process that is not discernible by current methodologies until 6–8 days following immunization (30, 32). This is in apparent contrast to the human GC reaction, as Liu and colleagues have recently provided evidence that a subset of human GC B cells undergoes class switching, and that this occurs subsequent to the initiation of somatic hypermutation (41, 42). The uncharacterized 53-kDa cell surface determinant BLA-1 was previously reported to be expressed by GC B cells (27, 43). Interestingly, BLA-1+ cells were capable of adoptively transferring memory responses 6 days, but not 6 wk following immunization (43), and hapten-specific, sIgG1+ B cells were found to express BLA-1 at day 6, but not at day 24 postimmunization (27). Together, these data indicate that BLA-1 expression is modulated during the evolution of the GC reaction. We therefore studied the kinetics and distribution of BLA-1 expression on GC B cells. In Fig. 4⇓A, the vast majority of GC B cells were BLA-1+ at 4 days postimmunization, consistent with previous phenotypic analyses. By day 8, however, BLA-1 expression became heterogeneous; approximately two-thirds of GC B cells were BLA-1+, but one-third was now BLA-1−. The frequency of BLA-1+ GC B cells continued to decrease until by day 12 approximately one-half of the GC B cells were BLA-1+ and the other half BLA-1−, a pattern also evident during the third week postimmunization (Fig. 4⇓B). By 24–26 days following challenge, little or no surface BLA-1 was present on GC B cells (data not shown). Therefore, the pattern of BLA-1 expression closely correlated with the distinct phases of GC evolution, with uniform expression typical of the inductive phase, heterogeneous expression characteristic of the established phase, and relative absence representative of the dissociative phase. BLA-1 expression is dynamic throughout the primary GC response and with sIgM resolves the GC compartment into four subsets. A, Splenic mononuclear cells were isolated 4–14 days postimmunization and stained with cyanine 5.18 anti-B220, FITC-PNA, and biotin anti-BLA-1, followed by PE-streptavidin. The contour plots show the correlated expression of BLA-1 and PNA by B220+-gated cells. Numbers within the contour plots represent the average percentages of total B220+PNAhigh cells determined to be BLA-1+ or BLA-1− (n = 4). The crosshairs represent the cutoff for the determination of BLA-1+ vs BLA-1− based on staining with isotype controls. The range of percent positives for each time point is as follows: day 4 (88–94%), day 6 (84–87%), day 8 (58–85%), day 10 (57–73%), day 12 (26–60%), day 14 (42–62%). B, Splenic mononuclear cells were stained with Texas Red anti-B220, FITC-PNA, PE-BLA-1, and biotin anti-IgM, followed by cyanine 5.18-streptavidin. Contour plots indicate correlated BLA-1 vs sIgM expression within the B220+PNAhigh-gated population at days 8, 12, and 18. Numbers in the contour plots are the average percentages of the respective GC B cell subsets within the total B220+PNAhigh population (n = 4): (clockwise from the upper right) BLA-1+sIgM+, BLA-1−sIgM+, BLA-1−sIgM−, BLA-1+sIgM−. To further examine the distribution of BLA-1 within the GC B cell population, we evaluated the expression of BLA-1 with respect to sIgM among GC B cells at 8, 12, and 18 days postimmunization. In Fig. 4⇑B, sIgM and BLA-1 expression by B220+PNAhigh-gated cells defined four subsets at day 8 postimmunization. The predominant GC B cell subset at this time expressed both sIgM and BLA-1 and represented approximately one-half of the total GC B cell population and three-quarters of sIgM+ GC B cells. A prominent sIgM− BLA-1+ population was also evident at day 8, accounting for nearly one-third of total GC B cells and greater than one-half of sIgM− GC B cells. Two minor subpopulations, namely sIgM+ BLA-1− and sIgM− BLA-1−, each accounted for less than one-fifth of total GC B cells at day 8. The frequency of BLA-1+ GC B cells decreased between days 8 and 12 postimmunization, and this reduction was observed in both the sIgM+ and sIgM− GC B cell populations. The relative frequencies of sIgM+ and sIgM− GC B cells expressing BLA-1 observed at day 12 were maintained as late as day 18 (Fig. 4⇑B). These data indicate that BLA-1 expression is not restricted to sIgM+ GC B cells and that BLA-1 expression decreases as a function of time among both sIgM+ and sIgM− GC B cell subsets. It is largely accepted that most GC B cells are derived from mature naive B cells expressing sIgM and sIgD (5). The vast majority of GC B cells, however, have been reported to be sIgD−, including those bearing sIgM (8, 25, 26). sIgD+ GC B cells from human tonsils have been previously described (44, 45) and more recently isolated and partially characterized (46, 47, 48, 49). GC B cells expressing both sIgM and sIgD most likely represent a transitional stage between follicular mantle and GC B cells and may correspond to putative GC founder cells (48). We sought to identify such GC founder cells by examining within the GC B cell compartment the expression and distribution of molecules associated with naive B cells, namely sIgD, CD23, and CD38. CD23 is expressed late in B cell ontogeny, but is absent on isotype-switched B cells (50, 51, 52). Expression of CD23 on GC B cells, as tested by immunohistochemical means, has been difficult to determine due to robust expression of this molecule on follicular dendritic cells (53, 54). CD38 is expressed by naive B cells, down-regulated by GC B cells, and subsequently up-regulated by memory B cells (55, 56, 57, 58). As seen in Fig. 5⇓A, subsets of B220+PNAhigh cells both expressing and lacking CD38, CD23, and sIgD were observed following SRBC immunization. At day 4, B220+PNAhigh cells uniformly expressed CD38 (albeit at lower levels than on B220+PNAlow cells), more than one-half were CD23+, and nearly one-fifth were sIgD+. By day 8, a B220+PNAhigh population expressing high levels of CD38 could be identified, and the emergence of this prominent subset coincided with an increase in frequency of sIgD+ cells, suggesting that the CD38high cells also expressed sIgD. By days 12 and 18 of the primary response, the CD38high subset was less numerous, representing approximately one-third of the B220+PNAhigh population. These data are thus consistent with previous reports demonstrating diminished CD38 expression on GC B cells following immunization (57, 58). Although the sIgD+ subset had also decreased in relative frequency at these later time points, approximately one-half or more of the B220+PNAhigh cells remained CD23+. Because B220+PNAhigh cells expressing CD23 were less numerous than those bearing sIgM, but more numerous than cells displaying sIgD or CD38 (see Figs. 3⇑A and 5A), we speculated that the loss of sIgD and CD38 precedes that of CD23 within the sIgM+ GC B cell population. We further speculated that simultaneous evaluation of CD23 and sIgD or CD38 would identify discrete or overlapping populations possibly representing early intermediates in GC B cell ontogeny. This was confirmed in Fig. 5⇓B, in which sIgD+B220+PNAhigh cells were found to express high levels of CD23. A CD23+sIgD− population was also observed, in accordance with the data in Fig. 5⇓A, and suggesting that the loss of sIgD precedes that of CD23. The sIgD+B220+PNAhigh cells were also found to be CD38high and sIgM+ (data not shown). In Fig. 5⇓C, simultaneous examination of CD23 and CD38 expression revealed a CD38high population that similarly expressed high levels of CD23 at most time points. Although CD38 expression within the B220+PNAhigh compartment was not bimodal at day 4, a subset of CD23high cells expressing elevated levels of CD38 was detected. Fig. 5⇓C also demonstrates a small CD23+CD38low population, again indicating transition of GC B cells to a CD38low phenotype precedes loss of CD23. Together, these data indicate that the acquisition of PNA receptors can occur before the loss of sIgD, CD23, and CD38, and the resulting sIgM+sIgD+CD23+CD38highB220+PNAhigh cells may represent the earliest determinable stage of commitment to the GC reaction. This early stage is most likely followed by sequential loss of IgD and CD38, leaving a sIgM+sIgD−CD23+CD38low intermediate stage GC B cell. It is also of interest that both the sIgM+sIgD+CD23+CD38high and sIgM+sIgD−CD23+CD38low GC subsets are present at all time points examined, suggesting that founder cells are continually recruited into the GC reaction or maintained with a founder phenotype once the GC has been established. Subsets of B220+PNAhigh cells defined by the expression of CD38, CD23, and sIgD may correspond to early intermediates of GC B cell ontogeny. A, Splenic mononuclear cells on days 4, 8, 12, and 18 postimmunization were stained with cyanine 5.18-B220, FITC-PNA, biotin anti-CD38, biotin anti-CD23, or biotin anti-IgD, followed by PE-streptavidin. The contour plots show the correlated expression of these markers and PNA by B220+-gated cells. Inflections between the populations revealed by CD38 and sIgD staining served as the cutoff for determination of CD38high and CD38low or sIgD+ and sIgD−, respectively. The crosshairs within the CD23 contour plots represent the cutoff for determining CD23+ and CD23− based on staining with isotype controls. B and C, Splenic mononuclear cells at 4, 8, 12, and 18 days postimmunization were stained with Texas Red anti-B220, FITC-PNA, and either cyanine 5.18 anti-IgD and biotin anti-CD23 followed by PE-streptavidin (B) or PE anti-CD38 and biotin anti-CD23 followed by cyanine 5.18-streptavidin (C). Contour plots represent the correlated expression of sIgD and CD23 (B) or CD23 and CD38 (C) by B220+PNAhigh-gated cells. Data presented in A were derived from the same experiment and are representative of at least four experiments at each time point. Ranges of percent CD38high cells are: day 8 (39–66%), day 12 (33–34%), day 18 (27–54%). Ranges of percent positives for CD23 are: day 4 (61–72%), day 8 (58–69%), day 12 (62–70%), day 18 (42–65%). Ranges of percent positives for sIgD expression are: day 4 (17–27%), day 8 (14–41%), day 12 (08–35%), day 18 (14–19%). As the IgD+B220+PNAhigh cells were an unexpected finding, especially at the later time points, we further explored the location of these cells relative to GCs. Specifically, we used two-color confocal microscopy of fresh splenic sections to determine whether these cells were within or outside of established GCs. This technology was chosen because it leaves sensitive epitopes intact and generally allows for greater sensitivity compared with other techniques. Spleens were harvested from animals immunized 8 days previously with SRBC (corresponding to the peak of the primary GC reaction and the time at which the IgD+B220+PNAhigh cells were most numerous in the previous flow-cytometric experiments). Splenic sections were then stained with FITC-conjugated anti-IgD (green) and cyanine 5.18-conjugated PNA (blue) to delineate both IgD+ cells and GCs. In spleens from unimmunized control mice, IgD+ cells were limited to the follicles, and PNA staining exhibited a background reticular pattern consistent with quiescent spleen (data not shown). In a day 8 immunized spleen, however, PNA+ GCs were readily apparent. As illustrated in Fig. 6⇓, IgD+PNA+ double staining cells were also evident (appearing as turquoise cells), and surprisingly, could be found in several follicular sites. In addition to a small number residing within the GC, clusters of IgD+PNA+ cells were observed in the mantle both at the GC mantle interface and in areas more distant from the GC. This was a consistent finding in three separate immunized mice (data not shown). Thus, while IgD+PNA+ cells were indeed part of the GC, a significant fraction of this population was found outside of the GC. Although the meaning of this result is presently unclear, the finding of non-GC IgD+PNA+ cells may be consistent with IgD+ cells being continually recruited into the GC reaction (founder cells) or IgD+ cells exiting the GC as post-GC or memory B cells. Two-color confocal microscopic analysis of IgD+PNAhigh cells. Spleens from mice immunized 8 days earlier with SRBC were sectioned and stained with FITC anti-IgD and cyanine 5.18-PNA. 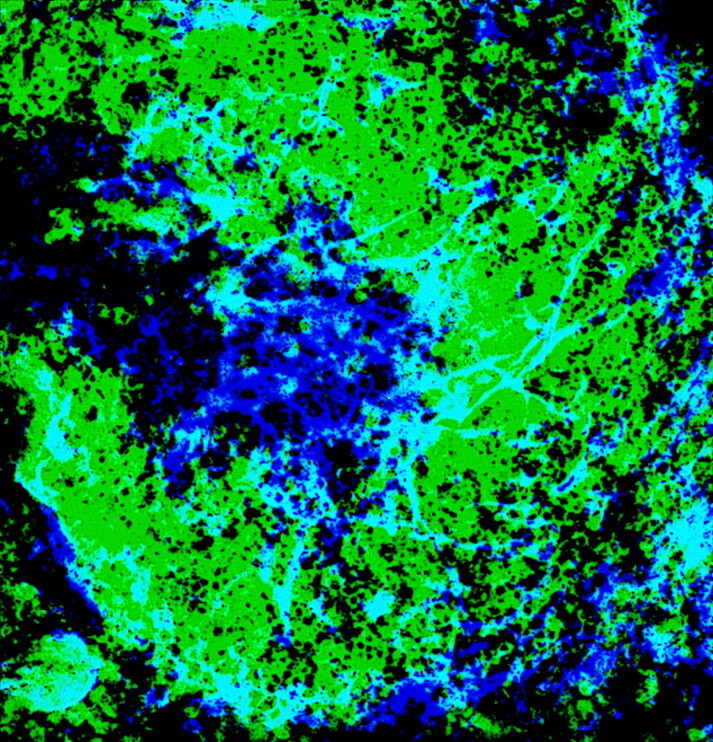 Dark blue (PNA+) areas represent the GC, and green (IgD+) areas represent the follicular mantle. IgD+PNA+ double staining cells are seen as turquoise cells or clusters. Results are representative of three immunized spleens examined. We subsequently extended our phenotypic analysis of GC B cells to include the relatively uncharacterized late phase of the GC response, primarily to determine whether the GC B cell subsets that were established early following immunization persisted throughout the response. As shown in Fig. 1⇑, B220+PNAhigh cells were still consistently detected 16–26 days postimmunization. Interestingly, and despite the reduction in the overall frequency of GC B cells, the subsets defined by sIgM, CD23, and CD38 expression were still present and in the relative frequencies observed upon their establishment during the inductive phase (data not shown). sIgD expression was less evident at these times with between 10 and 15% of total B220+PNAhigh cells expressing sIgD (data not shown). In addition, fewer GC B cells expressed BLA-1 at these later time points, although 20–30% of GC B cells were BLA-1+ as late as days 22–24 (data not shown). Similar to primary B lymphopoiesis in the bone marrow, Ag-driven peripheral B cell maturation in the mouse is accompanied by profound changes in cell surface phenotype. In peripheral lymphoid organs, B cells committed to differentiate into plasma cells down-regulate certain B cell-specific markers such as sIg and B220, but acquire cell surface determinants such as syndecan-1 and PC-1 (27, 32, 59, 60, 61). Likewise, B cells participating in the GC reaction are distinguishable from other B cell subsets due to their high avidity for PNA (25, 26, 62). Previous phenotypic studies have provided significant information regarding the molecules expressed by murine GC B cells and have enabled investigators to unambiguously identify this B cell population (25, 26); however, a detailed evaluation of GC B cell phenotypes at numerous time points following immunization has not been described. Such an examination would have the potential to delineate populations corresponding to distinct stages of GC B cell ontogeny, from GC founder cell to memory or plasma cell precursor, wherein the various processes associated with the GC (e.g., somatic hypermutation, isotype switching, and differentiation to memory B cells or plasma cells) are thought to occur. The multiparameter flow-cytometric data presented in this study provide a comprehensive phenotypic analysis of the murine GC B cell compartment at consecutive intervals following primary immunization of BALB/c mice with SRBC. We defined GC B cells as B220+PNAhigh splenic mononuclear cells, and the validity of this combination of surface determinants was verified in several ways. In addition to demonstrating this population’s Ag, T cell, and CD40 dependence, B220+PNAhigh cells were found to be comprised exclusively of mature B lineage cells that expressed markers previously ascribed to GC B cells, but were devoid of markers associated with AFCs (Figs. 1⇑ and 2⇑, Table I⇑, and data not shown). We subsequently resolved the GC B cell population into discrete subsets based on the expression and distribution of various Ig isotypes (sIgM, sIgD, and sIgG1), the activation marker BLA-1, and differentiation Ags (CD23, CD38). sIgM was found to be expressed by more than one-half of GC B cells isolated 4–26 days following SRBC immunization (Fig. 3⇑A, data not shown). sIgG1+ cells were also evident at day 4 postimmunization, and represented between one-quarter to one-third of GC B cells at that and all subsequent time points (Fig. 3⇑A). The sIgG1+ cells accounted for the majority of sIgM− B cells, and few bona fide sIg− cells were observed at any time postimmunization (Fig. 3⇑, data not shown). Strikingly, although the frequency of the total GC B cell population waxed and waned, the relative frequencies of sIgM+ and sIgG1+ GC B cells remained nearly constant, possibly reflecting the establishment of a dynamic steady state between class-switched and nonswitched GC B cells (Fig. 3⇑). The kinetics and distribution of Ig isotypes observed during the primary anti-SRBC response are consistent with earlier studies demonstrating the rapidity of isotype switching in vivo (27, 30, 32, 59), but raise questions regarding the extent, kinetics, and duration of the isotype switch reaction with respect to GC formation and evolution. In immunohistochemical analyses of C57BL/6 mice responding to a thymus-dependent form of the hapten NP, isotype-switched cells were first detected within extrafollicular PALS foci (from which both AFCs and GC founder cells originate), and the majority of GCs observed (first seen in this report at day 8) were comprised almost entirely of isotype-switched cells, indicating a rapid and near total conversion from sIgM to sIgG in both PALS foci and GCs (30). Although subsequent studies by Kelsoe and colleagues reported GC formation as early as day 4 postimmunization (63), the heavy chain isotype expressed within these early GCs was not examined. Using multiparameter flow cytometry, other studies of the primary anti-NP response revealed that Ag-specific, isotype-switched GC and non-GC B cells displayed similar kinetics with respect to appearance and exponential expansion, but the relative frequencies of nonswitched vs switched NP-binding GC B cells were not evaluated (27, 32, 59). In the primary anti-SRBC response of BALB/c mice described in this study, sIgG1+ and sIgM+ GC B cells emerged at the same time as GC B cells first become discernible, and the relative frequencies of these two populations did not change appreciably over the ensuing 2–3 wk of the response. Surprisingly, no gradual (or sudden) diminution in the sIgM+ population coincident with an equivalent increase in the sIgG1+ population was observed (Fig. 3⇑). These findings could be interpreted to mean that the isotype switch reaction not only begins to occur before or concomitant with the induction of GCs, but that class switching is restricted to this early phase of B cell activation. Thus, the relative frequencies of the switched and nonswitched populations established during the early stage of B cell activation would remain essentially unchanged after this window of opportunity for class switching had passed. Alternatively, the present data could imply that isotype switching involving μ and/or other heavy chain genes may occur continuously throughout the GC response, with regulatory mechanisms maintaining a nearly constant frequency of both switched and sIgM+ B cells. Although it is unclear which mechanism accounts for the almost fixed frequency of switched and nonswitched cells in response to SRBC challenge, evidence for both exists in other systems. Specifically, studies have provided support for isotype switching at extrafollicular sites early in the response as well as in the GC later after Ag challenge. As discussed above, immunohistochemical studies by Kelsoe and colleagues have provided evidence for switching in both PALS foci and GC (30). Toellner et al. (39) and Peakman and Maizels (64), combining RT-PCR or in situ hybridization with immunohistochemistry, respectively, examined the localization of switch transcript production in situ and reported the predominant site of isotype switching during anti-NP responses to be in the extrafollicular T cell regions of immunized spleen. Peakman and Maizels (64) documented that peak transcript production preceded GC formation, although switch transcripts were detected within GCs subsequent to their appearance, suggesting GCs also have the potential to serve as sites of isotype switching. Consistent with this, Zinkernagel and colleagues (65), performing immunohistochemical studies following primary infection with vesicular stomatitis virus, reported both switched and nonswitched GC B cell populations at day 12 following infection. This is of interest because PALS foci are not observed in response to vesicular stomatitis virus immunization. Finally, evidence for isotype switching within the GC also comes from human studies in which switch transcripts and DNA excision loops, intermediates in deletional isotype switch recombinations, were detected in sort-purified GC B cell subsets (41, 42). It is thus possible that the present results could be explained by either switching before GC formation, within the GC, or both. Experiments examining sIgM+ and sIgG1+ GC B cells at various times after SRBC immunization for intermediates of the isotype switching reaction are in progress to directly address this issue. The persistence of sIgM+ cells throughout all stages of the primary response was particularly striking, and could also be explained by a protracted recruitment of mature sIgM+ cells into the GC reaction, although some of the sIgM+ cells may well represent the precursors of sIgM+ memory cells, direct evidence for which has been reported in the human (66, 67, 68, 69). However, most sIgM+ GC B cells also expressed CD23 (data not shown), a determinant expressed late in B cell ontogeny, but absent from isotype-switched or sIgM+ memory B cells (50, 51, 67). Moreover, and as discussed below, a significant proportion of sIgM+ GC B cells simultaneously expressed sIgD, CD23, and levels of CD38 comparable with follicular B cells. Collectively, these phenotypic data are consistent with many of the sIgM+ cells corresponding to GC founder cells or other early stages of GC B cell differentiation. Recently, human GC founder cells have been identified and partially characterized (46, 47, 48, 49). This population exhibited a phenotype reminiscent of both follicular and GC B cells, including the expression of sIgD, sIgM, CD23, and CD38. In our studies, mAbs directed against murine sIgD, CD23, and CD38 revealed subpopulations of B220+PNAhigh cells expressing these respective markers (Fig. 5⇑A). This phenotype is virtually identical to that described for human GC founder cells, allowing for the possibility that murine sIgD+CD23+CD38highB220+PNAhigh cells likewise represent the first stage of GC commitment. Surprisingly, B220+PNAhigh cells expressing sIgD, CD38, or CD23 were detected after day 10, when the peak of the GC response (as measured by the frequency of B220+PNAhigh cells) had diminished (Fig. 5⇑A). Although the significance of this observation is currently unclear, it could suggest that recruitment from the follicular B cell pool may occur for an extended period of time following SRBC challenge. Further phenotypic analysis revealed that CD23, CD38, and sIgD demarcated discrete but overlapping populations potentially corresponding to early stages of GC B cell ontogeny (Fig. 5⇑, B and C, and data not shown). From the kinetic analyses and the four-color flow-cytometric data, it would appear that during the process of commitment to the GC reaction, sIgM+sIgD+CD23+CD38high follicular B cells acquired receptors for PNA before the loss of sIgD. Based on the comparative frequencies of sIgM, sIgD, CD23, and CD38-expressing GC B cells, it is likely that both sIgD and CD38 were subsequently down-regulated by the sIgM+ GC B cells. In contrast, CD23 expression was maintained until the sIgM+ GC B cells either underwent isotype switching or proceeded further along the GC developmental trajectory toward nonswitched memory B cells, as few sIgM+CD23− GC B cells were detected until about day 8 (data not shown). Although sIgD+B220+PNAhigh cells have previously been detected 12 days following immunization of C57BL/6 mice with NP keyhole limpet hemocyanin (70) and IgD+ cells can be found within presumptive GCs 9 days after immunization with pigeon cytochrome c (71), IgD expression by murine GC B cells has not been well described. To more thoroughly investigate the IgD+B220+PNAhigh population observed by flow cytometry, we employed two-color confocal microscopy of splenic sections to examine cellular localization. IgD+PNAhigh cells detected 8 days following immunization were found within the follicular mantle of secondary follicles, along the border of the follicular mantle and the subjacent GC, and within the GC (Fig. 6⇑). The presence of non-GC IgD+PNAhigh cells is of particular interest, and can be interpreted several ways. One could suggest these cells to be at an early stage of activation and commitment to the GC, and hence founder cells, as discussed above. Alternatively, these cells might be IgD+ GC B cells emigrating from the GC, and hence represent a population of memory cells, especially at later time points. It is also possible that both processes are going on simultaneously. That murine IgD+PNAhigh cells might represent post-GC memory cells is all the more intriguing with the recent revelation of a population of human memory B cells expressing not only sIgM, but also sIgD (68, 69). In the human studies, CD27 expression was found to distinguish human memory B cells (both sIgM+ and sIgM−) from naive B cells (68, 69), raising the possibility that this marker may prove useful in murine studies as well. In preliminary experiments, however, few if any murine GC B cells were found to express detectable levels of CD27 at days 4, 8, 12, and 18 postimmunization (Shinall and Waldschmidt, unpublished observations). Unlike the situation described above for isotype distribution, expression of the activation Ag BLA-1 within the GC B cell compartment was found to be dynamic over time. BLA-1 expression was initially uniform, but became heterogeneous by the end of the first week. By day 12 and thereafter, approximately one-half of the GC B cell population expressed BLA-1, and by days 24–26, most GC B cells were devoid of this marker (Fig. 4⇑A, and data not shown). Intriguingly, simultaneous evaluation of sIgM and BLA-1 expression at different times following immunization revealed four GC B cell subsets with the predominant GC B cell population, expressing both sIgM and BLA-1 (Fig. 4⇑B). BLA-1 expression decreased among both sIgM+ and sIgM− cells as a function of time. These data confirm and extend earlier studies that documented expression of BLA-1 in GCs at early but not late time points following immunization (27, 43). The identity, function, and regulation of expression of BLA-1 remain unclear, although polyclonal activators such as LPS can induce BLA-1 expression on cultured B cells and such BLA-1+ cells have the forward light scatter characteristics of B cell blasts (43). Given the distribution and kinetics of BLA-1 expression within the GC compartment and the restriction of BLA-1 to LPS blasts in vitro, it is conceivable that BLA-1 expression may coincide with proliferating GC B cells. Alternatively, expression of this Ag may be induced early during GC B cell ontogeny, and subsequently become down-regulated as a function of time, cell division, or availability of stimuli (e.g., Ag, T cell-derived costimulation), and thus may serve to distinguish recently recruited from resident GC B cells. We are currently investigating the relationship between BLA-1 expression and proliferative and differentiational status within the murine GC. In summary, the present work identifies GC B cell subsets potentially corresponding to distinct stages of GC B cell ontogeny defined by the differential expression of isotypes (IgM, IgD, IgG1), the activation marker BLA-1, and differentiation Ags (CD38, CD23) as well as the kinetics of their induction and persistence following primary immunization of BALB/c mice with SRBC. Importantly, in comparative studies, the subsets identified in this study were conserved in other strains of mice immunized with SRBC and in BALB/c mice immunized with other thymus-dependent Ags, suggesting that these subsets are general rather than unique to the SRBC response (S. Shinall and T. Waldschmidt, manuscript in preparation). The generality of the findings may therefore allow for further work in the mouse describing subsets or stages of GC B cells in which distinct genetic programs are turned on, leading to affinity maturation and memory cell formation. We thank Dr. Lee Herzenberg for providing 53-10.1 mAb (anti-BLA-1), Dr. Douglas Fearon for providing the 1D3 mAb (anti-CD19), DNAX Research Institute (Palo Alto, CA) for providing the 1C10 mAb (anti-CD40), Dr. John Kearney for providing clone 90 mAb (anti-CD38), Teresa Duling for expert operation of the flow cytometer, Lorraine Tygrett for expert technical assistance, and Carla Hartl for assistance in the preparation of this manuscript. ↵1 This work was supported by National Institutes of Health Grant AI 31265. ↵3 Abbreviations used in this paper: GC, germinal center; AFC, Ab-forming cell; BSS, balanced salt solution; HSA, heat-stable Ag; LT, lymphotoxin; NP, (4-hydroxy-3-nitrophenyl)acetyl; PALS, periarteriolar lymphatic sheaths; PNA, peanut agglutinin; SB, staining buffer; sIg, surface Ig.